Once again it's the unwatched pot that boils over. A revolt that started in Tunisia has spread to other countries in Africa and the Mideast. Protests in Egypt have gotten downright ugly as demonstrators threw firebombs and chanted "Down with Hosni Mubarak, down with the tyrant." Police responded with teargas and bullets. Mohamed ElBaradei, an Egyptian dissident flew home to claim his stake in the revolution, but no one showed up to cheer. 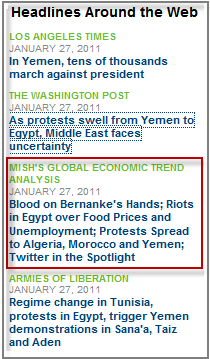 As noted earlier in Blood on Bernanke's Hands; Riots in Egypt over Food Prices and Unemployment; Twitter in the Spotlight, social media outlets, especially Twitter have played a leading role in organizing protests. CNN reporter Ben Wedeman confirmed Internet is down in Cairo and writes, "No internet, no SMS, what is next? Mobile phones and land lines? So much for stability. Confirming what a few have reported this evening: in an action unprecedented in Internet history, the Egyptian government appears to have ordered service providers to shut down all international connections to the Internet. Critical European-Asian fiber-optic routes through Egypt appear to be unaffected for now. But every Egyptian provider, every business, bank, Internet cafe, website, school, embassy, and government office that relied on the big four Egyptian ISPs for their Internet connectivity is now cut off from the rest of the world. The New York Times discusses World News Headlines on Yemen. Yemen, home to one of the world's oldest civilizations, is the poorest country in the Arab world as well as a haven for Islamic jihadists and the site of what amounts to a secret American war against leaders of a branch that Al Qaeda has established there. In January 2011, Yemen became the latest Arab state to see mass protests in the wake of a revolution in Tunisia, as thousands of Yemenis took to the streets in the capital and other regions to demand a change in government. Until the protests, the world's attention had mainly been focused on fears that Yemen could become Al Qaeda's next operational and training hub, rivaling the lawless tribal areas of Pakistan where the organization's top leaders operate. Yemen faces a violent separatist movement in the south and an increasingly bold insurgency by Al Qaeda. An intermittent rebellion in northwestern Yemen that flared up again in August 2009, leaving dozens dead and wounded, has added another element of instability. Al Qaeda's growing presence in Yemen — where it took credit for a deadly attack on the American Embassy in 2008 — is especially troubling because the country's fractious tribes and rugged geography make it notoriously difficult to control. Much of the violent tribal feuds, banditry and kidnapping appear beyond the control of the central government. Yemen has the region's largest arms market: the country, with roughly 20 million people, is said to have at least 20 million guns. Yemen is fertile ground for extremism not only because of its tribal culture and topography, but also because of its deep poverty, high illiteracy and birth rates, and government corruption. For more on the Al Qaeda connection and the Yemini threat, please see the 10-page New York Times article Is Yemen the Next Afghanistan? I am pleased to make the NYT global headlines list for my earlier report. Demonstrators angry over unemployment and oppression under President Ali Abdullah Saleh demand political change. The unrest worries the U.S., which has been working with the government to defeat an Al Qaeda offshoot. The current unrest in the Middle East spread to impoverished Yemen on Thursday as tens of thousands of protesters angry over unemployment and political oppression marched in the capital against President Ali Abdullah Saleh. Instability in Yemen is a major concern for Washington, which has been working with Saleh's government to defeat an entrenched Al Qaeda offshoot that claimed responsibility for last year's attempted bombings of planes over U.S. airspace. Officials fear anarchy in the country would give militants a strategic base in the Arabian Peninsula and the Horn of Africa. The U.S. has expanded its intelligence and security roles in the country, and American military aid is expected to reach at least $250 million this year, a major increase from previous years. But Washington has long been wary of Saleh, who runs a government based on patronage networks and has a history making questionable deals with enemies, including Islamic militants, who years ago were tolerated. The tumult in Yemen, where more than 10,000 people took to the streets of the capital, Sanaa, on Thursday, added a troubling new dimension to the regional unrest that began nearly two months ago in Tunisia. Yemen, one of the poorest and most heavily armed countries in the Middle East, is home to multiple separatist movements and has its own particularly virulent branch of al-Qaeda. "Yemen is a different game," said Khairi Abaza, a Middle East expert and a senior fellow at the Washington-based Foundation for the Defense of Democracies. "If things go out of hand in Yemen, you have many players who will be waiting to try to affect the outcome, from al-Qaeda to Iran." The only certainty, experts said, is uncertainty - an extended and potentially dangerous period of instability that is probably just beginning. "What happened in Tunisia is completely unprecedented in the Arab world," said Bruce Riedel, a former CIA officer who served as special assistant on the Middle East and South Asia to three presidents. "We've never had a dictator toppled by the street. As a consequence, there is no safety net, no organized opposition ready to move in. . . . No one has a clue what is going to emerge in some of these places." Riedel said the uncertainty, combined with speed of the change underway, presents the Obama administration with an array of difficult choices as it seeks to show support for democratic expression while working to preserve stability and prevent violence. Historically, U.S. governments "have never gotten these things right," he said. Thankfully, the protests in Yemen have not been violent. Mohamed ElBaradei, the Egyptian dissident, flew home to Cairo on Thursday night to stake his claim as the leader of the would-be revolution to overthrow President Hosni Mubarak. "If people, in particular young people, if they want me to lead the transition, I will not let them down," he told reporters in Vienna before boarding his flight. Mr ElBaradei presented his offer as a gesture of self-sacrifice, yet it is unclear how grateful the protesters will be. There were no throngs of people to greet him at the airport and many view the former chief of the United Nations nuclear watchdog with a degree of suspicion, seeing him as a rich outsider whose understanding of Egyptian suffering is limited. As Mr ElBaradei has seized the limelight, so Mr Mubarak has shunned it. There has been no sign of him since protests began. Members of his family are rumoured to have left the country. With the president looking ever weaker and more isolated, the outlawed Muslim Brotherhood, by far the largest opposition movement in Egypt, chose to make its first move by supporting the protests. "We are not pushing the movement, but we are moving with it," the group said in a statement. "We don't wish to lead it, but we do want to be part of it."